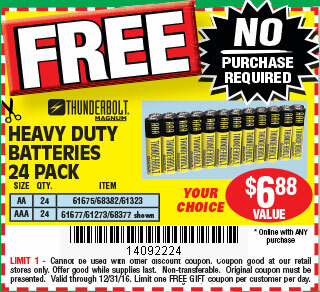 Savvy Spending: Harbor Freight Tools: Free Thunderbolt Heavy Duty AA or AAA Batteries 24 pack! No purchase required! Harbor Freight Tools: Free Thunderbolt Heavy Duty AA or AAA Batteries 24 pack! No purchase required! Harbor Freight Tools has a coupon for a FREE Thunderbolt Heavy Duty AA or AAA Batteries 24 Pack ($6.88 value – valid in-store only). No purchase is necessary, just print the coupon and bring it with you to redeem in-store. One per customer. Now through 12/31!